Looking for some sweet deals at Del Mar? The San Diego County Fair is in full swing starting Friday, and discounts are available for admission, rides and sodas through its 26-day run. Among those offered a break are military personnel, state workers, school employees, children, birthday girls and boys, college students and ardent readers. $5 DAYS: June 1 (opening day, starting at 4 p.m.), 2 and 6 are $5 admission days, at the fair. Tickets may be purchased only on Vons or Albertsons after a $10 minimum purchase. MILITARY: Military Free day is June 1 for all active duty personnel, reservists, retirees, military dependents and Department of Defense employees. Two complimentary tickets each are available at the base ticket offices. UNLIMITED VISITS: The Best Deal Ever pass allows people unlimited visits for $28. The savings for this pass start on June 2 for adults and June 3 for seniors and children. These passes can be purchased online, at the fair or at Vons or Albertsons through June 30. DISCOUNT PACKAGES: Costco Savings Packs, ranging from $16-$80, with discounts on admission, drinks and rides. Two packages (25 game and ride coupons for $16; and an $80 admission, ride and drink discount) are sold only through May 31. Two others are available online at Ticketmaster or at any county Costco location. SWEET 16 FREEBEE: People whose 16th birthday lands on June 16 can get into the fair free that day. Present a photo ID at the entrance gate that shows your birthday. KIDS’ DAYS; On Kids’ Days, children ages 12 and younger can enter the fair free every Friday of June. TWO-FOR-ONE: Two admissions for the price of one discounts are offered through San Diego County Toyota Dealers. These tickets are valid only from Wednesdays through Fridays. Pick up a coupon at a Toyota dealership and redeem it at the fair box office. Terms and conditions are listed on the coupons. Toyota dealerships also are offering two free tickets when getting their car repaired. Those tickets are valid any day of the fair. STATE EMPLOYEES: California civil service employees can get two $6 admission to the fair on the following Fridays: June 8, 15 and 22. Show a state employee ID or paycheck stub at the Will Call window at the O’Brien Gate. SCHOOL EMPLOYEES: School staff appreciate days are Fridays: June 15, June 22 and June 29. Get four free tickets from a county Mission Federal Credit Union branch when presenting a school employment ID. Tickets are available while supplies last. COLLEGE STUDENTS: College students can attend the fair for $10 or get an admission and ride sheet package for $26, which included 25 ride tickets. Students must present their college or university photo ID at the box office. These tickets are available only at the fair box office on the day of the event. TICKETS FOR DONATIONS: Persons making a donation of new clothes or cash will receive free fair admission between 11 a.m. and 2 p.m. June 7. Donations will help Mattress Firm help foster children. READING CERTIFICATE: Children up to age 12 get free admission one day if they read 10 age-appropriate books that are verified by their teacher or librarian. Children can receive a certificate sdfair.com/educational-programs/reading-certificate/ for free admission. GROUP SALES: Groups can choose from 16 ticket options, including unlimited fair admission. Group tickets, which are only available online, must be purchased in advance, but redeemed on the same day. TRANSIT DISCOUNTS: Fair Tripper packages are available for discounted transit fare and fair admission See sdfair.com/plan-your-visit/public-transportation. $26 DISCOUNT TICKETS: O’Reilly’s Auto Parts is giving away coupons for two adult weekday admission for $26. There is a limit of two coupons per store visit per customer. The coupons are not valid on weekends or July 4. 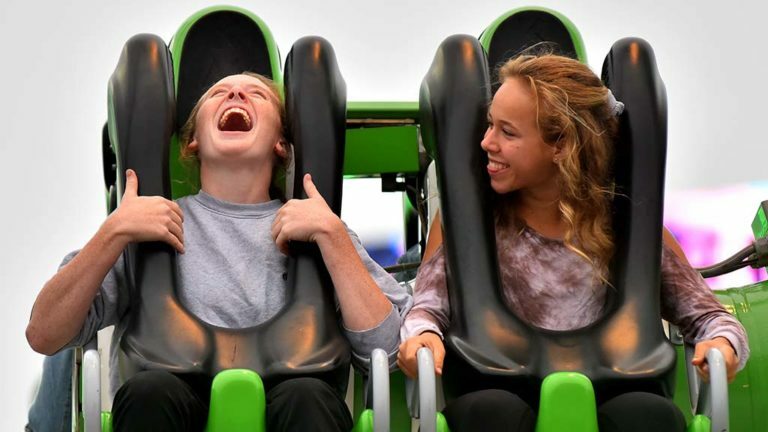 UNLIMITED RIDES: On Pay-One-Price Ride Days, ride wristbands are available for unlimited rides in Fun Zone and Kids Zone until 8 p.m. on select Wednesdays and Thursdays: June 6, 7, 13, 14, 20, 21, 27 and 28. FOOD DISCOUNTS: Taste of the Fair days from noon to 5 p.m., fairgoers can by food samples from vendors for $3. Most of the more than 100 food booths take part. KIDS’ MEALS: Participating food booths offer kids’ meals for $5.99 or less or an entrée, side dish and drink. GROUPON: Groupon is offering discount tickets for two or three person for up to 58 percent discounts. The fair runs through July 4, but is closed all Mondays and Tuesdays throughout that period. Fair hours are 4-11 p.m. June 1; 11 a.m. to 10 p.m. Wednesdays and Thursdays; 11 a.m. to 11 p.m. Fridays; 10 a.m. to 11 p.m. Saturdays; 10 a.m. to 10 p.m. Sundays, 11 a.m. to 10 p.m. on July 2; 11 a.m. to 11 p.m. July 3; and 10 a.m. to 11 p.m. July 4.